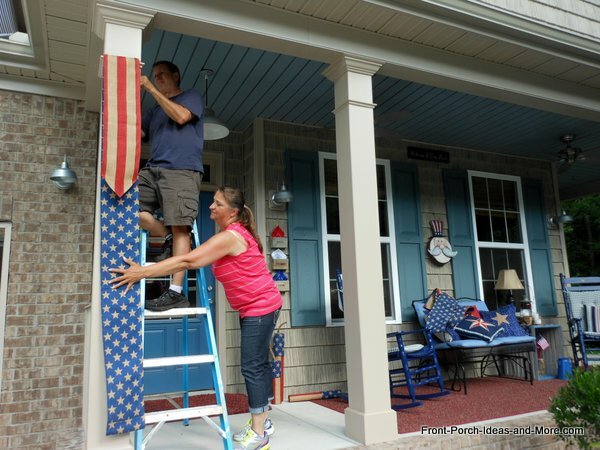 When Dave and I came across some beautiful Americana burlap in patriotic colors, we knew that decorating with burlap was going to be the foundation for our 4th of July porch decorating this year. 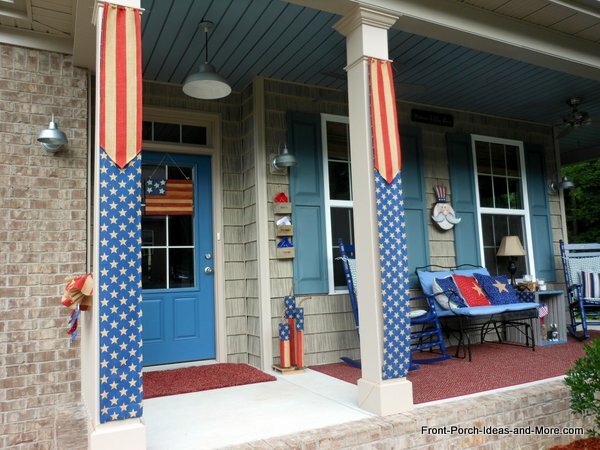 We wanted to decorate our porch columns with homemade patriotic banners and this burlap, with its Americana feeling, is a nice fit for our cottage-style home. Burlap, because of its design, durability and body, is a great material for banners and wall hangings. 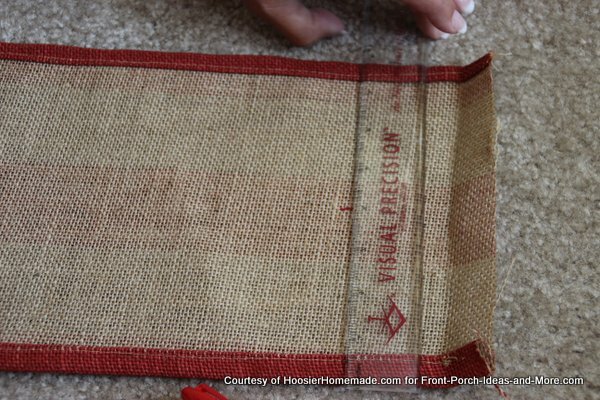 Making these burlap banners for our porch was one of those fun projects that we are very proud how they turned out. 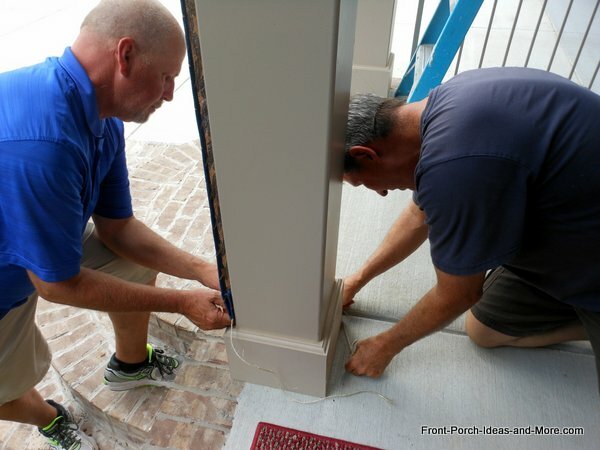 Measure the front of your porch columns, that is, the part that you want to cover with the banner. We wanted our banners to be approximately 8" wide by 81" tall. 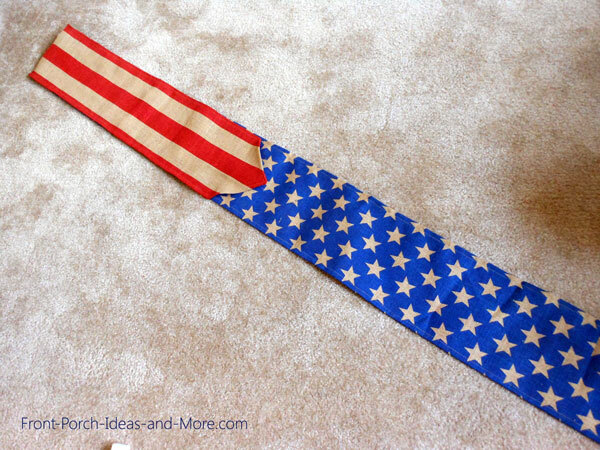 Then add two inches to the width and four inches to the height. 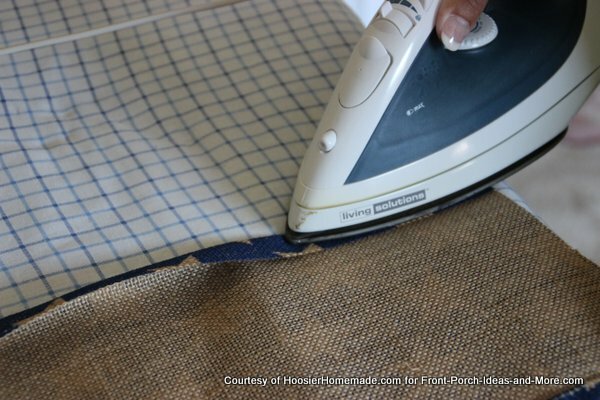 This will give you a generous 1" hem on each of the sides and 2" hem on the top and also on the bottom. So for our columns, Marcia cut our burlap to be 10" wide by 85" tall. Hem the sides first and you will finish the top and bottom later. Fold over a half inch and then another half inch. Iron and pin well. Liz graciously did all the ironing and pinning. Here you see her just getting started. 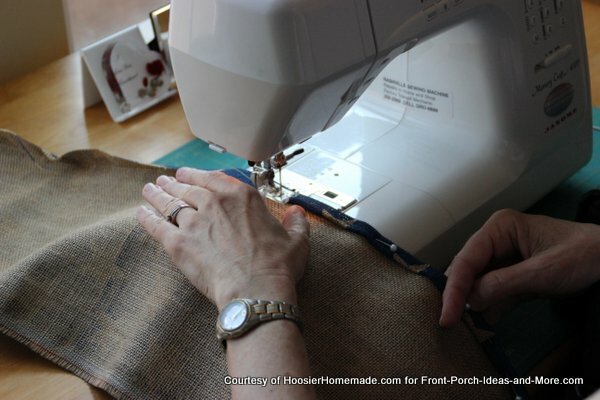 Once she had the sides ironed and pinned, I took the burlap over to my sewing machine and sewed the hems on both sides. 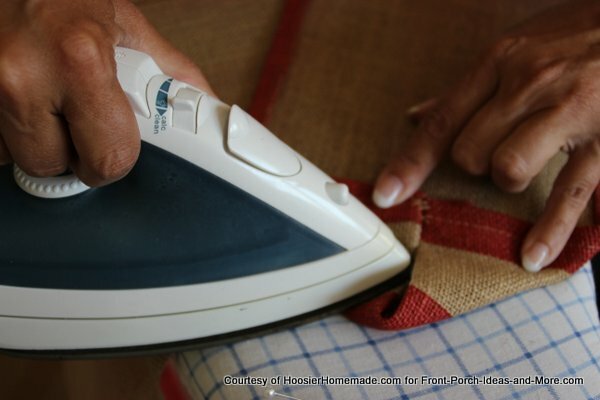 If you don't like to sew, you may be able to glue the edges down or use hem tape. Try it on a small piece first. 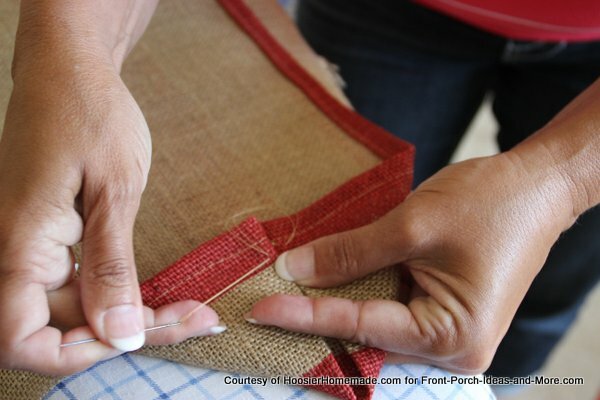 Once you have the sides hemmed on the starry blue burlap, you are ready to work with the red burlap. Again the top and bottom hems will be done in a later step so no worries. 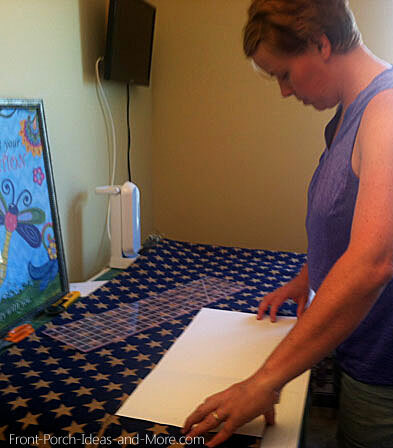 For this part of the banner, the red striped portion, cut the burlap the same width as the blue layer but only about 1/3 the height of the blue layer. 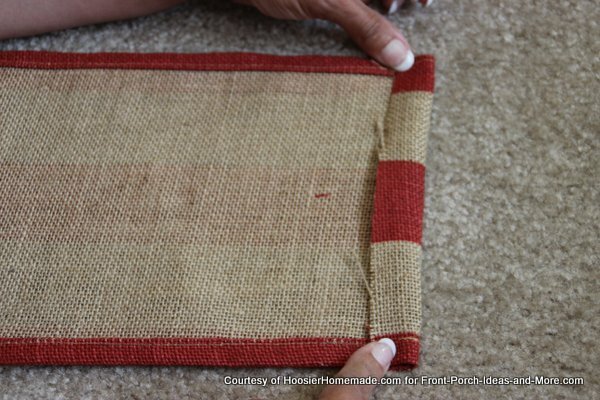 So in our case, we cut the red burlap to be approximately 10" wide by 30" tall give or take. Nothing scientific about this - whatever looks nice to you. Hem the sides just the same as you did for the blue layer. 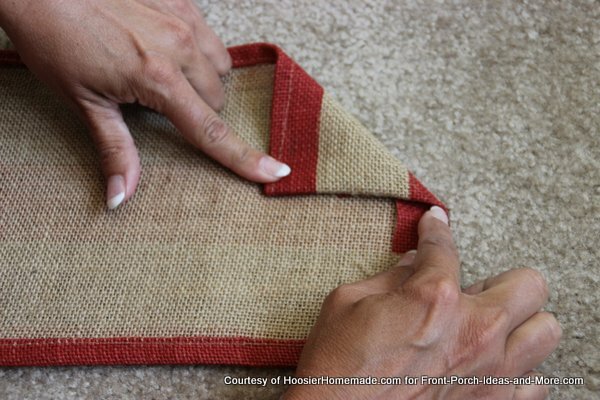 Once the red burlap is hemmed on both sides, it's time to form the point - like you see here - the to give it a "pennant" look. 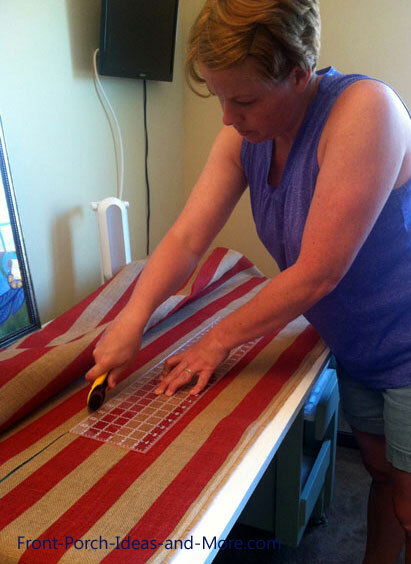 Liz is forming the "pennant" point on the red striped burlap. First she marked the center of the width and marked it with a pen. Then she folded over the edge about a half inch. Then she folded the first side to the center point. And then the other side to meet the first. She ironed the point and then sewed a few stitches in it to keep the sides of the point together. Then we laid it all out on the floor just to gauge how it looked. Liz and I decided it looked pretty great; I will enjoy decorating with burlap again. To finish the banners, we hemmed the bottom and the top. On the top, I sewed the blue and red layers together as I hemmed them. The hems not only finished off the banners but also serve as channels that you thread the twine through to hang the banners. I also tacked down the red point onto the blue stars so that it wouldn't get caught in the wind too much. To hang, we threaded twine through the top and bottom channels that were created when he hemmed the tops and bottoms. 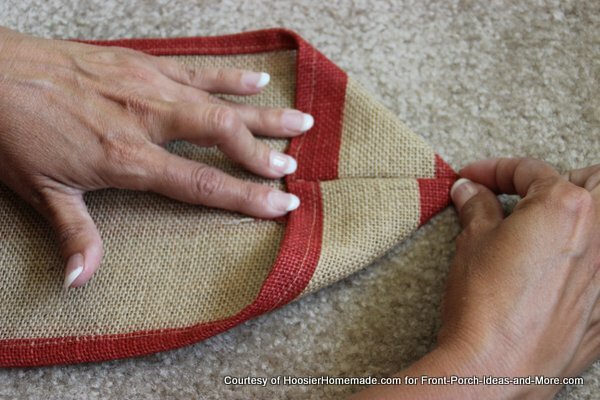 You can use a safety pin or crochet hook to pull the twine through the hem. Be sure to leave a generous tail of twine on either side so that you can pull it around the column and tie it securely. It was windy when we hung the banners so Liz helped hold them while Dave fastened them to the tops of the porch posts. Dave and Doug wrapped the twine around the base of our porch column to secure the banners. And here they are. We are all delighted with how everything turned out. Happy 4th of July! We had a few pieces of burlap left from the banners so we put it to good use on our porch. Liz came up with a great idea to use the remnant burlap to cover our homemade firecrackers rather than paint them. 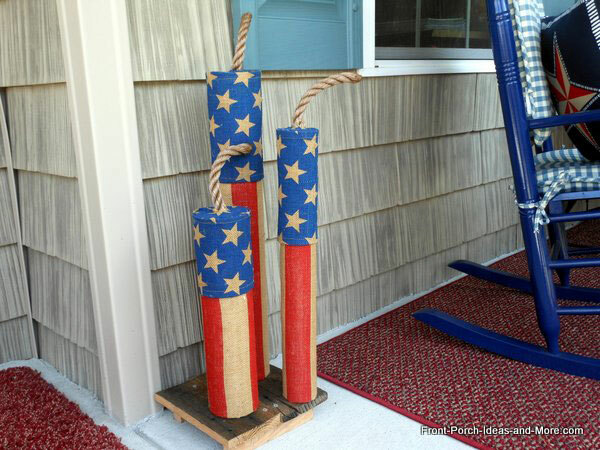 Did we give you some 4th of July decorating ideas? I hope so. 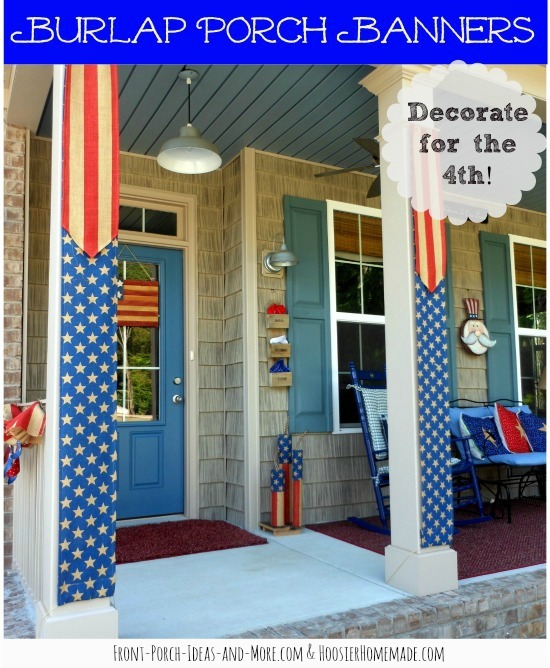 You can get more ideas for decorating with burlap from our 4th of July porch page. 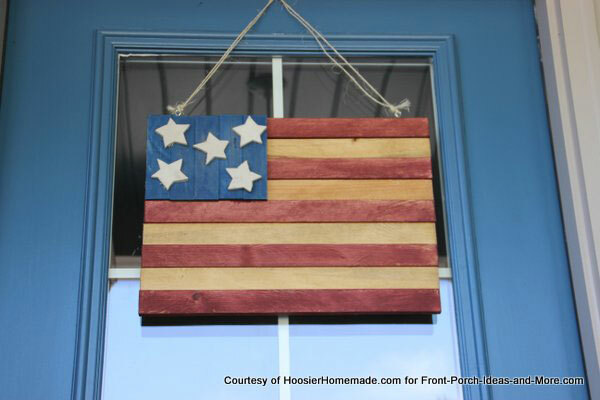 We share with you how we made this rustic Americana flag for our front door. 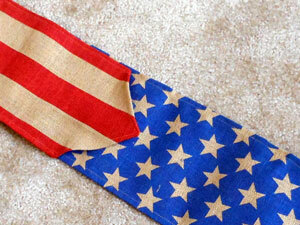 You'll be surprised at how easy this is - and how great it goes with our patriotic burlap banners.